Are you confident about your email deliverability? Email is critical for your business, but is it reaching your customers? Are you protecting your brand from spoofers and scammers? MxToolbox is your expert on email deliverability. MxToolbox Delivery Center Plus gives you the broadest insight into your email configuration, threats to your email deliverability and how to improve your email delivery to reach your customers and protect your online brand. 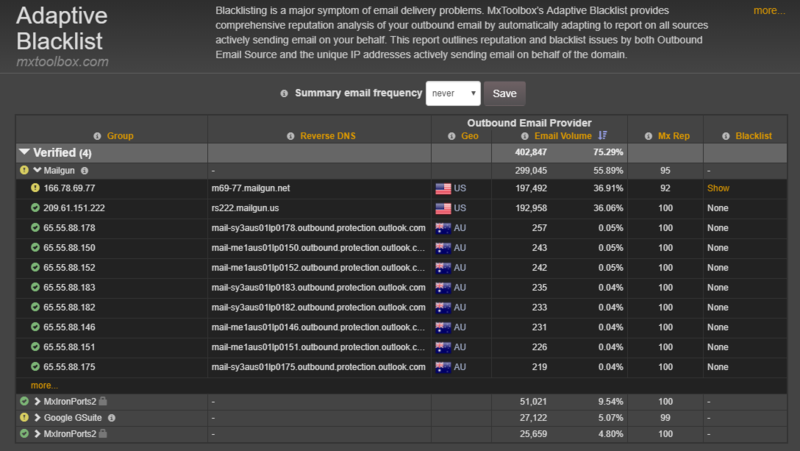 MxToolbox Delivery Center Plus provides a complete real-time analysis of the blacklist reputation for all of your email sending sources. No matter who is sending email on your behalf, your email reputation will be closely monitored to protect your email delivery and business from blacklisting. Regular monitoring of your senders’ blacklist reputation. Real-time adaptation as your email sending posture changes. Google, Yahoo!, Outlook.com and other inbox providers prioritize email from senders with proper DMARC, DKIM and SPF setups. That’s over 1 Billion inboxes you could be missing! MxToolbox Delivery Center Plus provides the best solution for setting up and monitoring your DMARC, DKIM and SPF compliance rates. Higher compliance rates mean better email deliverability and better email inbox delivery. It's easy for a malicious actor to create email that looks on the surface like it comes from you. These spoofers will use your good name to commit crimes against your unsuspecting customers, suppliers and vendors. Even smaller businesses can find the majority of the email supposedly coming from their domain to be spoofed email. MxToolbox Delivery Center Plus gives you all the information you need to understand emerging threats to your email deliverability and stop them before they hurt your business. MxToolbox Delivery Center Plus provides you with detailed IP ownership, geolocation and IP reputation information to allow you to make informed decisions about threats and unknown IP addresses. Rest easy with MxToolbox knowing that threats to your business will be uncovered quickly. 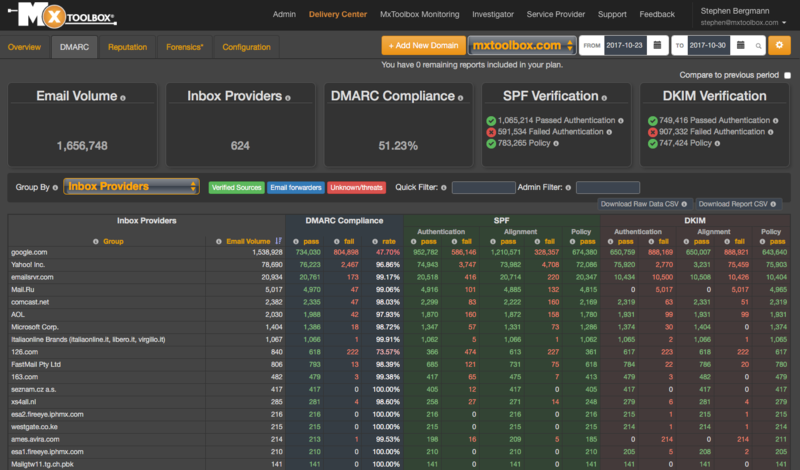 DMARC inbox providers look at your DMARC policy to see how they should process non-compliant email. Once you are comfortable that all your legitimate email sources are SPF, DKIM and DMARC compliant, it's time to shut down your threats. Changing your DMARC policy from None to Quarantine to Reject takes time and experimentation so that you don't inadvertently block legitimate email. MxToolbox Delivery Center Plus enables you to easily move to more restrictive DMARC policies while ensuring that you can monitor the compliance rates of legitimate senders. No matter who is sending email on your behalf, you can rest assured that a restrictive policy will only improve your email deliverability.